I want a burger now! This is a piece of welfare for burger lovers in this game. You can enjoy many burgers with different tastes! 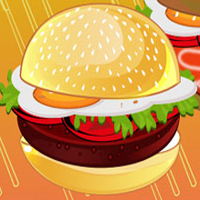 Manage a burger store and make your favorite burgers for your customers! Follow their request and make the right burger. How many cash can you earn?